Find out the latest goings on at Colorolio®! Huge Discounts! Black Friday Through Cyber Monday in Effect! COLOROLIO HAS CAUGHT HOLIDAY FEVER! Massive Unannounced 50% OFF price drop in effect through Cyber Monday! ORDER TWO OR MORE COLOROLIO Exemplar SETS for an ADDITIONAL DISCOUNT of up to 20% OFF our already low Holiday Fever Induced Price Cut! Prices are going right back up after Cyber Monday. Take our word for it. If you love to color . . . or know someone who would enjoy the joy coloring brings, now is the time to grab an extra set or two before this discount ends. Fill the Empty Stockings with Colorolio! Grab your extra set of Colorolio Exemplar today! In appreciation of its customers, Colorolio is announcing a tiered discount available immediately on their premier set of colored pencils. Colorolio Exemplar, a set of 24 wax based colored pencils can now be purchased at tiered discounts through Amazon.com. Colorolio states that buying two (2) pencil sets earn the buyer a 5% discount, three (3) pencil sets earn the buyer a 10% discount, four (4) pencil sets earn the buyer a 15% discount, and five (5) sets earn the buyer a 20% discount. "We felt the time leading up to Thanksgiving was the perfect time to offer discounts to our customers for a short while," says Peter Rasputin, Operations Manager at Colorolio. "In schools, children are involved in arts and crafts at this time of year. Children use colored pencils for construction paper crafts, pop up cards, and Thanksgiving themed drawings. Their parents use them for scrapbooking projects as well as in-house entertainment as the weather begins to turn colder in the Northeastern part of the United States." Rasputin finishes by saying, "We want as many people as possible to enjoy these pencils, as we head into the Holiday Season." Colorolio's 24 set of colored pencils is presented in a elegant case providing safe storage and travel capability for the artist on-the-go. Pencils breaking in transit is not uncommon. Colorolio addresses this real world concern by adding a molded chamber to all its sets providing protection for the pencils inside. Colorolio Exemplar set of 24 artist grade colored pencils are available exclusively today through Amazon.com. Pricing details, technical specifications, and a full list of features and benefits are available online at Amazon.com. Colorolio Exemplar features some of the highest quality drawing instruments available on the market today. Whether one is drawing still lifes, designing costumes, touching up previous work, or even creating comic book characters, everything appears vibrant, detailed and sharp, delivering an unrivaled drawing experience. Colorolio stands by their product with a 100% satisfaction guarantee, details of which are available on their website. 1.) BRAIN-BODY BENEFITS. Like Yoga, meditation, or prayer, the quiet concentration needed for applying color to images can be a soothing experience. This creative, personal activity can lower blood pressure, pulse rate, while calming the nervous system. This fosters quiet evenings at home and a better night's sleep. Turning off the outside world in favor of the absorbing activity of creating a work of art builds an awareness of self through something both simple and inspiring. 2.) HASSLE FREE "ME" TIME. It's hard to remember a world without the internet. But, many adults of a certain age do. A world without instant messaging, Facebook, Twitter, and all the other 24/7 newsfeed nonsense. That simpler world can be re-experienced through adult coloring books. Peter Rasputin, Manager at Colorolio, an online seller of high quality colored pencils, says this seems to be a huge reason for their spike in sales. "We never imagined our colored pencils would be a favorite for adult coloring books." Rasputin says he receives emails daily from customers with pictures of coloring work done with Colorolio colored pencils. "People seem hungry for simplicity. For a reason to unplug from their devices. Coloring satisfies that hunger." 3.) FAMILY TIME. Coloring with your children engages their creativity at the same time it focuses their energy, making it the perfect before bedtime activity. Kids need unplugging, too. Coloring with Mom, Dad, (or Uncle Bob) can be a fantastic way for the whole family to collaborate. This low tech, absorbing activity brings families together around the table, fostering conversation and communion. The opposite of the sitting on the sofa watching TV experience. All in all, adult coloring is a healthy, low energy, highly imaginative activity that can foster greater self-awareness and peace when done solo or foster joy when done as a family. Folks need to get away from their ithis and ithats occasionally. 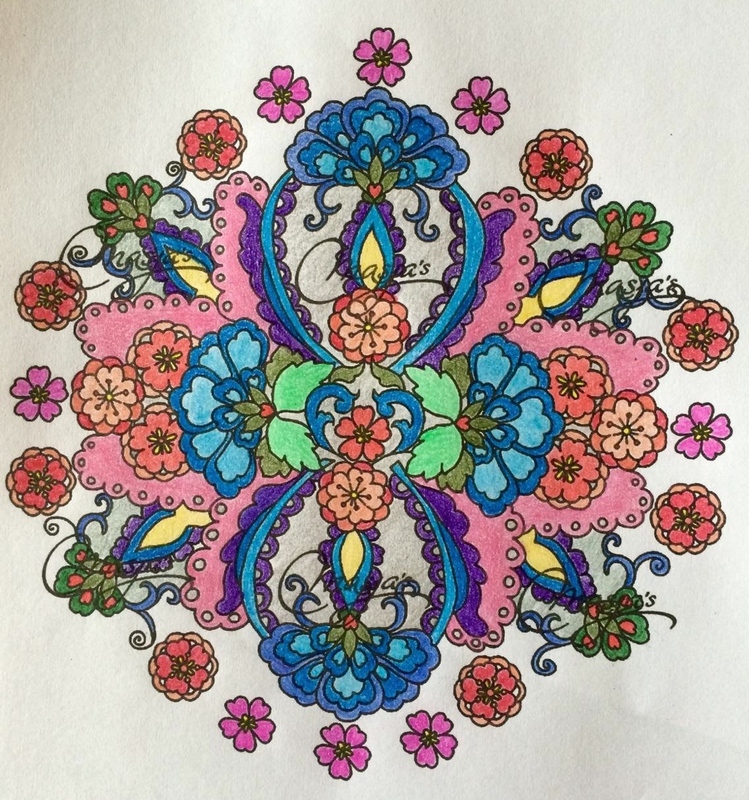 Coloring, as an activity, can be quickly picked up during breaks at work or home. And in the end, one is left with a piece of original art. So, grab a coloring book, some colored pencils, and experience the serenity that coloring offers. It's as simple as filling the empty spaces with color. Colorolio is making their premier set of colored pencils, called the Colorolio Exemplar, more affordable and just in time for the Halloween Season. Colorolio Exemplar, a set of 24 wax based colored pencils now starts at $22.97 through Amazon.com. The 24 set features a slender metal case with a hinged lid to provide easy storage and travel capability for the traveling artist. Additionally, it offers protection from accidental breakage and corrals pencils into one location. Colorolio Exemplar features some of the most high quality drawing instruments available on the market today. Whether one is designing costumes, drawing still lifes, retouching previous work, or creating anime characters, everything appears vibrant, detailed and sharp, delivering an unrivaled drawing experience. Colorolio stands by their product with a 100% satisfaction guarantee. "We felt Halloween was the perfect time to drop the price for a short while," said Peter Rasputin, Operations Manager at Colorolio. "Halloween is a time for arts and crafts in grade schools. Children use colored pencils for pop up cards, construction paper crafts and drawings, and Halloween gifts. Their parents use them for Halloween themed scrapbooking projects as well as in-house entertainment as the weather begins to turn colder in the Northeastern part of the United States." Rasputin finishes by saying, "We want as many people as possible to enjoy these pencils, hence the drop in price." List of speakers featured some of the most famous cartoonists in the world. Cartoon Crossroads Columbus (CXC), a new festival celebrating small press comic book companies and their artists, kicked off October 1st in Columbus, Ohio. Running for three days, spread across four different venues, CXC hosted world renowned cartoonists Jeff Smith, Art Spiegelman, Francoise Moully, Bill Griffith, Craig Thompson and many others. The intention of the festival going forward, as stated by Tom Spurgeon, CXC's Director, is to "demonstrate Columbus' potential for becoming the world capital of comics and cartooning." Comic book conventions have become increasingly popular over the years. Blockbuster films based on comic book characters have raked in billions of dollars worldwide, increasing exposure of the medium that gave birth to Spider-Man, The Avengers, and The X-Men. As a result, curious fans have been led to reexamine this uniquely American Art form; the comic book. Columbus, Ohio seems a natural fit for the festival. Home to the world's largest collection of comic art, The Billy Ireland Cartoon Library and Museum, located on The Ohio State University's campus, contains well over 450,000 pieces of cartoon art. In cooperation with CXC, the museum hosted several seminars about self-publishing, drawing technique, as well as interviews with guest artists. A sample display in the Small Publishers Room. Peter Rasputin, Operations Manager of Colorolio LTD, a Columbus based art supply company, sees the festival as entirely unique. "These days, comic conventions are less about celebrating the art form and more about celebrating media celebrity. Admission costs can easily run $100 to attend a three day event. This cost is used to cover travel for the film and tv stars in attendance." "At CXC," says Rasputin, "cartoons, comics, and their creators are front and center. Admission is free. Emphasis is more on education and art appreciation rather than commerce. Colorolio works with artists everyday, so we're glad to see this growing up in our backyard." Small Publishers display their wares on a rainy Saturday in Downtown Columbus, OH. CXC's publisher's room was lively and well attended during it's Saturday open, in spite of the rainy weather. Located at the Columbus Cultural Arts Center, Fantagraphics INC., Toon Books, and other small press publishers presented their latest. Signings by artists were a part of the festivities. "We're looking forward to next year's CXC," said Rasputin. "We hope this becomes a Columbus tradition in years to come." Alfred Molina as critic Arthur H. Cartwright. Copyright funnyordie.com. Since we launched our premiere set of artist pencils - the Exemplar 24 Set - the reviews are beginning to trickle in. We're humbled that initial reaction has been very positive. We’re proud of our box’s design. It captures a thoroughly modern approach to pencil art that we feel is needed. But, what's inside is what counts. Glad you liked the pencils! B. quinlan states, “ I often sketch with colored pencils and these are fantastic; beautiful, vibrant colors, perfect for renderings! I also love the durable case, but I do wish it had a latch or stayed closed a little tighter for traveling purposes. We hear you, B.Q.! Please send us your drawings. We’d love to feature them on the site. Here’s a post from someone who likes to use our colored pencils for Adult Coloring Books (not as naughty as it sounds). Glad you’re enjoying them, Bellakat! Have you used our pencils to make some awesome works of art? Maybe you just like doodling or coloring with them. Please share your creations with us. We may put them up on our website and Facebook page. Our 24 set of Artist Pencils can be purchased at Amazon.com. Colorolio™ Exemplar debuts on Amazon. Fill the Empty Spaces with Color. Model shots of our beautiful first product are beginning to arrive! Colorolio Exemplar is Twenty-Four Artist Quality pencils securely housed in a sturdy tin box. Its hinged lid provides both convenience and security for your pencils. One of the challenges of being an artist working with traditional media is keeping all your tools together. Because many artists use many different kinds of pencils, portability becomes important when splitting up work at different locations. Compact and light weight, Colorolio Exemplar's metal case has a small footprint, is less than an inch thick, and is easily carried. Function and elegance go hand in hand to provide the perfect solution for the Artist-on-the-Go. We can't wait to get these in our hands so we can pass them along to our growing list of interested customers.